Thank you Smart Games for providing me with products to facilitate my blog review. I’m a huge fan of brain teasers, riddles, and puzzles. I like how a seemingly easy task or question turns into minutes or even hours of intense reflection, back-and-forth attempts, and often leads to out-of-the-box thinking. Oh, and few things are as satisfying as when you finally figure out a puzzle after wreaking your brains for who knows how long! As you probably already know, Smart Games is unbeatable when it comes to puzzle games! They create ever so addictive and clever games and apps with fun themes for all ages that kids and adults all over the world love. I’ve been a fan of their games for many many years. I’ve learned to not overestimate my skills even if I solve the first few puzzles quickly… Even as someone who feels has decent problem-solving skills, sooner or later (usually sooner…), I get stuck. I need to really concentrate and move pieces around until I finally see the solution. I find it so rewarding when I do solve a puzzle! 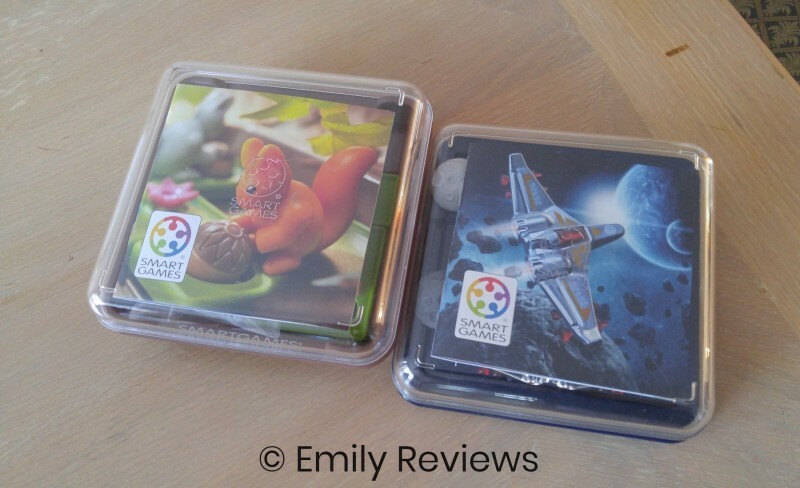 For this review, I receive 2 of their newest games: Squirrels Go Nuts and Asteroid Escape. Squirrels Go Nuts is an adorable sliding puzzle game for ages 6 and up. The goal of each puzzle is to help each squirrel to get ready for winter by hiding their acorn underground. 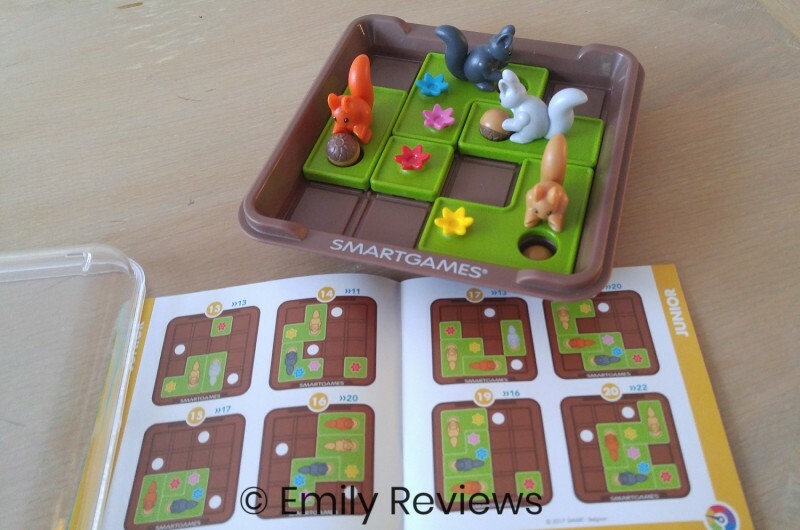 Each squirrel is on a patch of grass and must be placed according to the puzzle layout. You then slide them so their acorns fall through one of the holes on the board. My girls absolutely love this game! The squirrel theme was a hit and the game is so intuitive I didn’t even need to explain it to them. Even my 4-year-old manages to solve some of the puzzles with the biggest smile on her face! 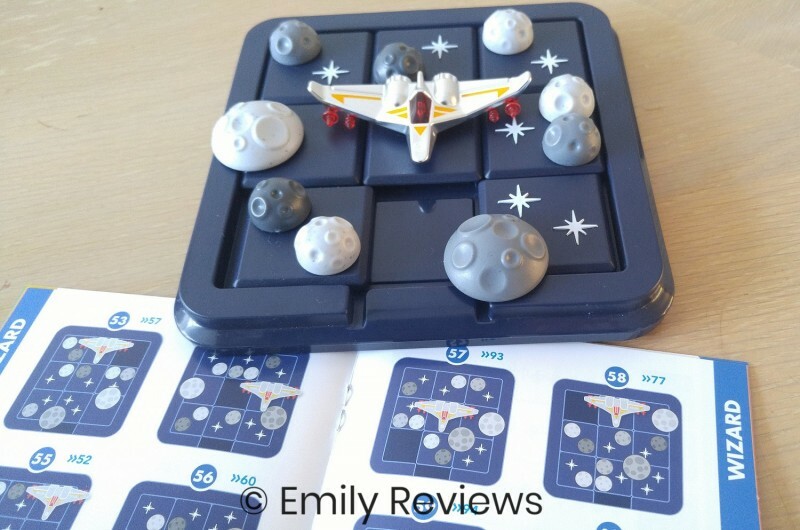 Asteroid Escape is a space-themed sliding puzzle game for ages 8 and up. The goal is simply to navigate a spaceship between asteroids and out of the board. Sounds easy, right? But it is deceptively challenging. At first, I thought it would be simple enough but what makes this game unique is that the asteroids are not nicely centered on each of the pieces as you can see above. So sometimes you think you figured it out only to get stuck because one asteroid sticks out blocks the movement of the spaceship or other asteroids. You definitely need great visual perception skills and lots of patience to figure these puzzles out! I really like how both games require you to plan ahead and use your spatial skills because you have to be able to visualize how to get each piece from point A to point B. It’s especially interesting for children who have to learn that the quickest, most direct move isn’t necessarily the one that will solve the puzzle. Because the games are so intuitive, children need very little instructions to know how to play. It was basically a matter of setting up the first challenge, showing them how the pieces move or don’t move and telling them the goal. That was it! My kids were then able to play all by themselves! Puzzles are also grouped by difficulty level so everyone can find challenges that match their skills. Younger children can start with the first set of challenges while older children and adults might be able to move to more advanced levels faster (although I still personally prefer to start with the easiest level first to ‘warm up’ and familiarize myself with the game). Another aspect of these Smart Games puzzles that I like as a parent who is always on the go is that these games are highly portable. They are compact and well built with relatively few pieces that all fit in the box. The set up is minimal so they can be played anywhere, anytime. We basically keep them in the car now so we have them when we are at the restaurant, while we travel long distances, while we wait in a queue somewhere, etc. They can also be played individually or cooperatively. As an individual game, these puzzles challenge players to persevere and think creatively. It also requires a fair amount of concentration to plan ahead, to remember what was tried, etc. Playing cooperatively with someone is actually a great way to develop efficient communication skills. Players also learn how to share their ideas and accept other people’s ideas, and use all kinds of emotional language to express frustration appropriately (yes, it happens but it’s part of the game and a good way to learn to deal with this emotion), to support each other, and to celebrate when the solution is discovered! Overall, I have to say that once again, Smart Games succeeded in creating thematic puzzles that develop problem-solving skills and spatial perception in a way that is fun and challenging for all ages! Find Out More: Head over to the Smart Games website for more information about these great puzzles. Connect: Don’t forget to like Smart Games on Facebook and follow them on Instagram, YouTube, Pinterest, and Twitter for all the latest news and promotions. I love these puzzles too. They will end up on my Christmas Wish List. Thank you for the review. The Penguins game looks like it would be fun. I’d play any of them though. These would be a great way to occupy the kids. Those are cute games. I remember having one of the simple(!) numbers puzzle when I was growing up. Great little game for traveling. These are adorable little games, I love that they come in hard plastic cases. My kids would definitely love them! And they would be perfect to take when we travel. Thanks for sharing! Now these look fun! I love them both. The colors are nice and bright and they would entertain for a long time. These would be nice to take along for trips, or long waits or in the car. These would be fun for any kid, but I bet that asteroid thing would be fun for a challenge with an adult!